Our staff can help you create the perfect tour package, our experienced driver and air-conditioned vehicle will make your tour comfortable and enjoyable. Be sure to take a stroll around the resort, you certainly won’t want to miss the Day Spa which offers a fabulous range of full body and beauty treatments designed to rejuvenate, refresh and restore. The holistic, no-stress approach ensures that guests leave the Spa feeling renewed and rebalanced, from the inside out. Utterly tranquil and totally private, the Day Spa's open-air massage pavilions with twin massage beds are heaven on earth. Caring and highly trained therapists soothe and pamper clients with their exotic treatments. 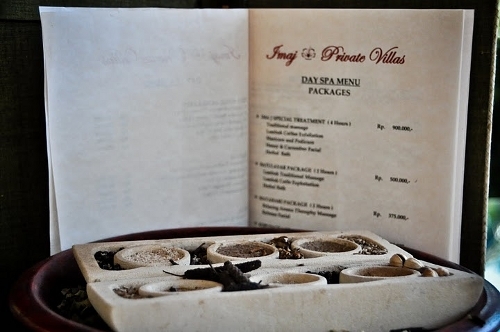 One Javanese speciality is Mandi Lulur, a revitalising massage followed by bathing in tropical flowers. Here you will also bathe in milk and honey, fruits, herbs and spices in a range of blissful massages, wraps and scrubs from around the world. The perfect way to unwind after an adventure filled day. We have two amazing chef’s onsite. We have a menu in each room. Our butlers will ask you what time you would like your meals and if you decide to eat in, your meals will be served in your private dining area. Click here to see an example of our food menu. • International calls: please ask at reception if you wish to make an international call. This can be done at the office and will be billed to your room. • We can also assist in arranging transfers to and from Bali. The nearest beach is a 5 minute drive down the hill.